The Earl V. Moore Building is the home to music at Michigan. Built in 1964, with significant additions in 1985 and 2015, the Moore Building houses the School’s musical performance, education, and scholarship departments as well as administrative offices. 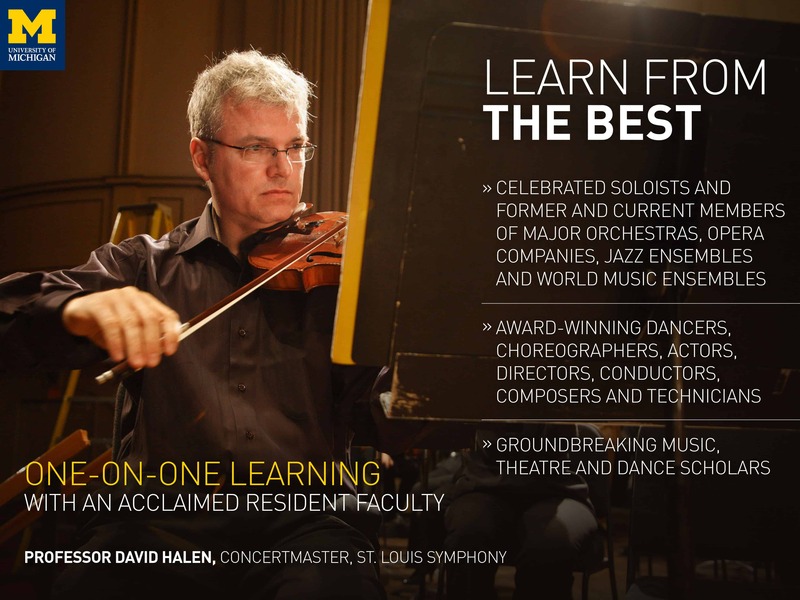 The 143,000 square foot facility includes classrooms, studios, practice rooms, rehearsal space, recital and lecture halls, a new music technology center, and a world renowned music library. WILLIAM K. and DELORES S. BREHM PAVILION – Built in 2015, the Brehm Pavilion added 21,900 square feet to the existing Moore Building, adding a state-of-the art lecture hall, a large ensemble rehearsal hall, three new smart classrooms, a suite of percussion practice rooms, an expansive technology center, and an inviting new main entrance and lobby, the Soderquist Atrium. 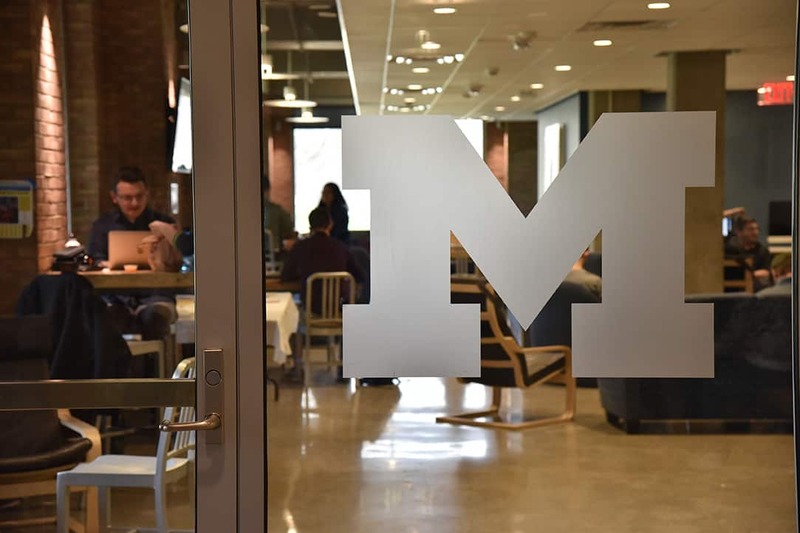 The lobby provides a comfortable communal space for faculty, students, and staff, as well as audiences attending events at the Moore Building. BRITTON RECITAL HALL – This intimate, comfortable hall serves as a performance and rehearsal space for solo recitals, and chamber music and other small ensembles. It doubles as a lecture hall and venue for master classes as well as lectures and performances by distinguished guests. It is named for Allen P. Britton, who served as SMTD dean from 1971-79. Britton Hall Live Stream (when available). McINTOSH THEATRE – Designed primarily for opera and musical theatre, the McIntosh Theatre is also used for choral, orchestral, and other ensembles. 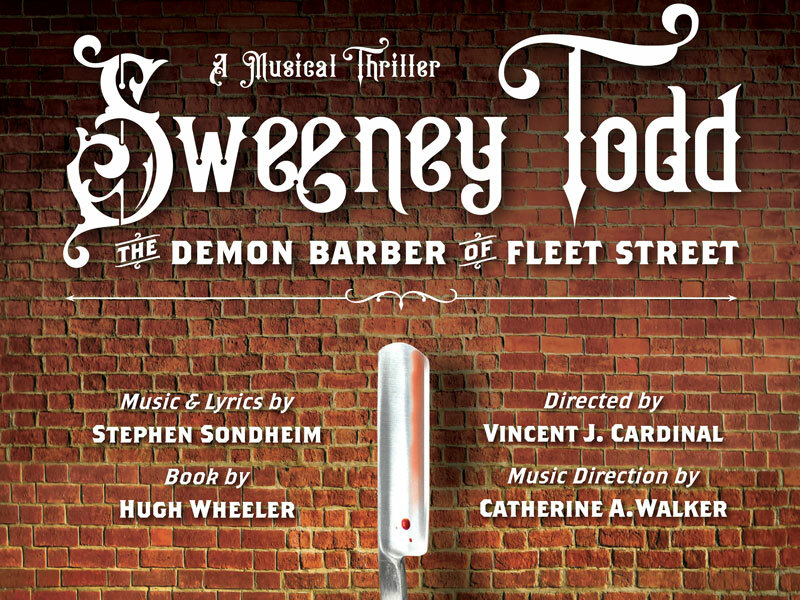 The theatre was added to the Moore Building in 1985 and received a complete acoustical upgrade in 2015, providing students with a professional quality rehearsal and performance space. McIntosh Theatre Live Stream (when available). BLANCHE ANDERSON MOORE ORGAN RECITAL HALL – As part of the 1985 expansion of the Moore Building, SMTD added this small recital and rehearsal hall and its C. B. Fisk organ, modeled after the instruments of the Gottfried Silbermann (1683-1753), whose organs were a favorite of J.S. Bach. It is now known as the Marilyn Mason Organ, named for the renowned organ professor who led the Department of Organ for 66 years. 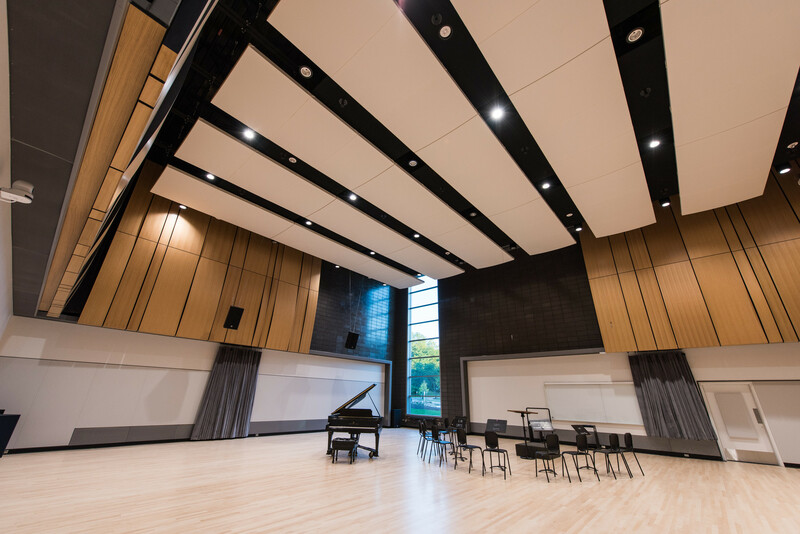 HANKINSON REHEARSAL HALL – Housed in the Brehm Pavilion, this new hall approximates the footprint of the Hill Auditorium stage and is designed to accommodate large instrumental ensembles. 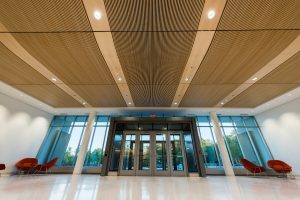 Providing natural light and excellent acoustics, Hankinson Hall is the home of the University Symphony Orchestra and the Symphony and Concert Bands. Hankinson Hall Live Stream (when available). GLENN E. WATKINS LECTURE HALL – Designed especially for academic lectures, state-of-the-art classroom teaching, and visiting scholar presentations, this large hall has allowed an increase of music lectures of all kinds and has helped consolidate music studies on North Campus. It is named for Professor Emeritus of Musicology, Glenn E. Watkins. Watkins Hall Live Stream (when available). CAROLYN and MILTON KEVRESON REHEARSAL HALL – Receiving a complete acoustical and aesethetic overhaul during the 2015 renovation of the Moore Building, Kevreson Rehearsal Hall is primarily used by SMTD’s by ensembles in SMTD’s celebrated programs in choral arts, orchestra, jazz, and gamelan, and is also suitable as a performance space. 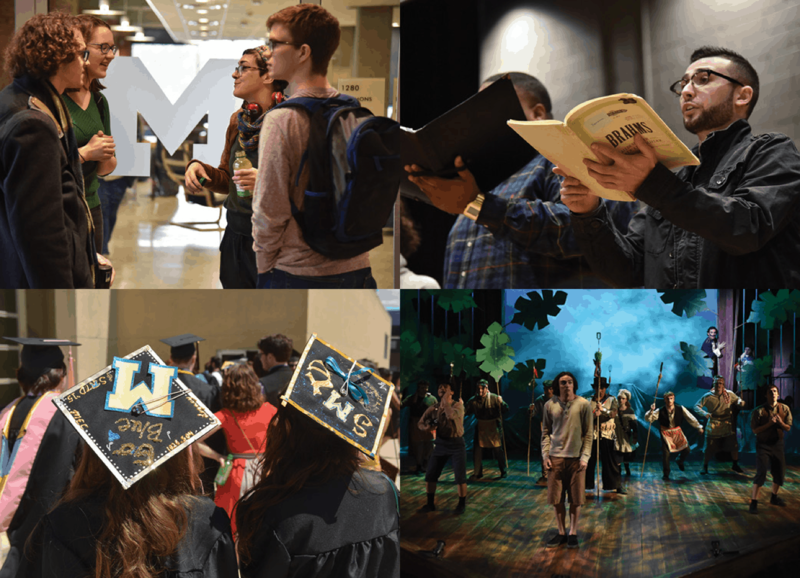 MUSIC LIBRARY – Recognized as one of the world’s major music collections, the U-M Music Library supports the performance, teaching, and research activities of the School of Music, Theatre & Dance. 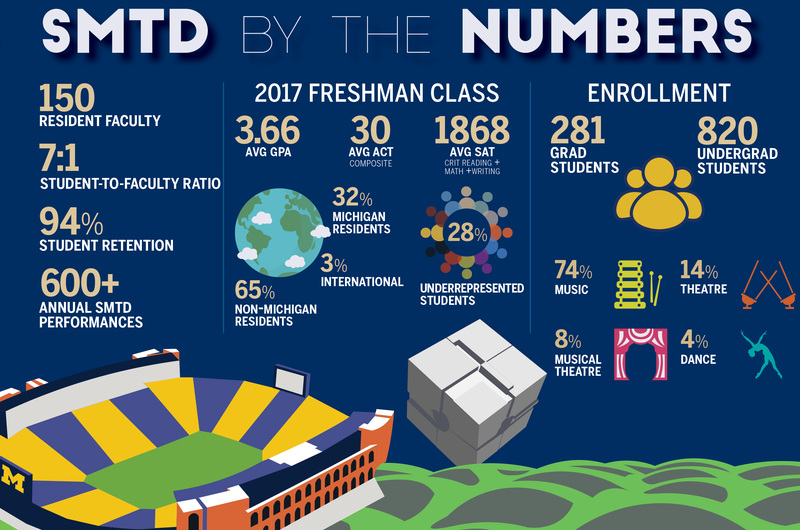 Located in the Earl V. Moore Building on U-M’s North Campus, the Library also serves the broader University community as well as national and international scholars, performers and teachers. The Music Library is part of the University Library system. BILL BREHM TECHNOLOGY INNOVATION SUITE – A multi-functional center on the Brehm Pavilion’s lower level, the suite provides critical labs and teaching facilities for electronic music composition and performance; developing music and sound for film; and independent student project work. 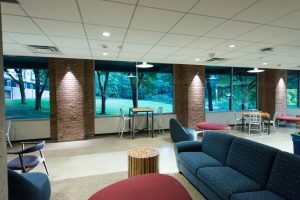 The suite also houses a control room/surround sound space; a workshop for prototyping and developing interactive electronic music devices; editing labs for audio and video, and comprehensive audio/video connectivity throughout the Moore Building. 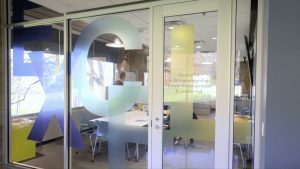 CHIP DAVIS TECHNOLOGY STUDIO – Located within the Innovation Suite, the Davis Tech Studio features a flexible, immersive, multi-media environment for interdisciplinary collaborations, installations, video recordings, performances, and rehearsals. 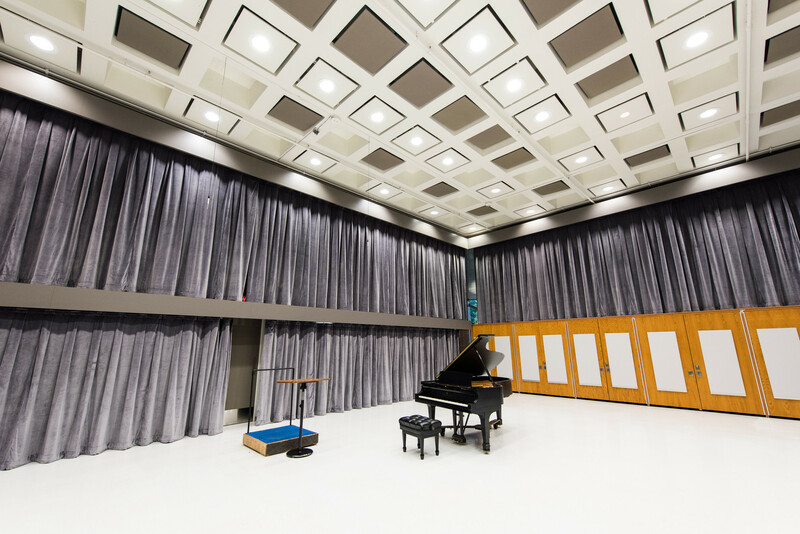 STEVEN M. SCHWARTZBERG PRACTICE WING – An expansive suite of private, acoustically superior practice rooms that provide readily available space to accommodate the multiple hours of practice required of music students. Thirty rooms feature grand pianos (for piano majors), and 64 are outfitted with an upright piano. Specially outfitted rooms include three for general chamber music rehearsal; three that are exclusive to piano chamber music; two for jazz combos (with drum sets, and amp hookups, etc. ); four organ practice rooms; five harp practice rooms; and four early music (harpsichord/fortepiano) rooms. The Wing also includes approximately 400 lockers, for instrument storage, and there is a room featuring computers and printers for student use. 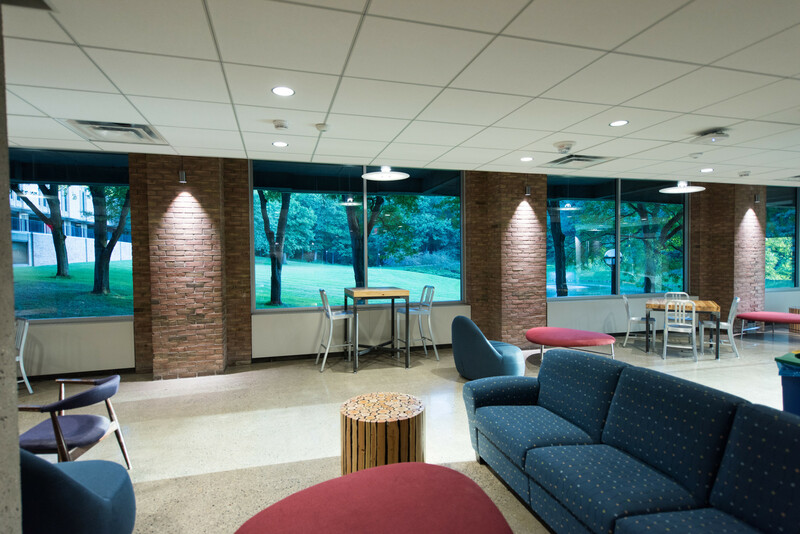 PUBLIC COMMONS – With a spectacular view of the Moore Building’s famous and bucolic pond, the public commons provides a convivial and comfortable space for students, faculty, and staff to relax, eat, collaborate, and study. Includes multiple vending machines, microwaves, seating, and tables. EXCEL LAB – Adjacent to the Public Commons, the EXCEL Lab serves as a hub for events, workshops, and meetings that are organized by EXCEL the entrepreneurship training and career services program that is available to all U-M students engaged in the performing arts. 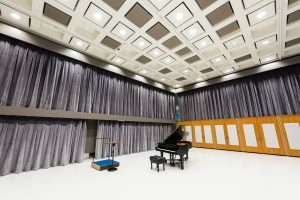 TEACHING STUDIOS – To accommodate the private instruction that is a hallmark of a music student’s learning experience at SMTD, each music faculty member has his or her own studio/office, each equipped with a piano (two for piano faculty). The spaces can accommodate small groups as well. PERCUSSION SUITE – A suite of practice rooms with advanced acoustical attributes exclusively designed for percussion, to accommodate one of the leading percussion programs in the nation. The rooms are available to students enrolled in percussion and jazz percussion, and can also double as teaching studios or rehearsal spaces.